add store customer card suport. remove alwaysRequireSignature and add collectSignature to checkout configuration. bump the minimum dependency to Reader SDK 1.1.1(iOS)/1.1.3(Android). this change does NOT include all new features introduced in Reader SDK 1.1. * such as Store customer card, see reader SDK Change Log for details. You have read the Reader SDK Overview. This quick start focuses on getting the sample app installed and running to demonstrate how the Flutter plugin works. You are familiar with basic Flutter development. Follow the Install instructions in the Flutter Getting Started guide to setup your Flutter development environment. Confirm your environment meets the Reader SDK build requirements listed in the root README for this repo. Open the Square Application Dashboard. You will need the Application ID and Repository password from the Reader SDK settings page to configure Reader SDK in the next steps. Confirm you have installed the required Android SDK elements. If you are unsure, the Reader SDK build requirements are listed in the root README for this repo. Configure an Android emulator that runs Android API 27 (Oreo, 8.1), and launch the emulator or connect your dev machine to an Android device running Android API 27 with development mode enabled. 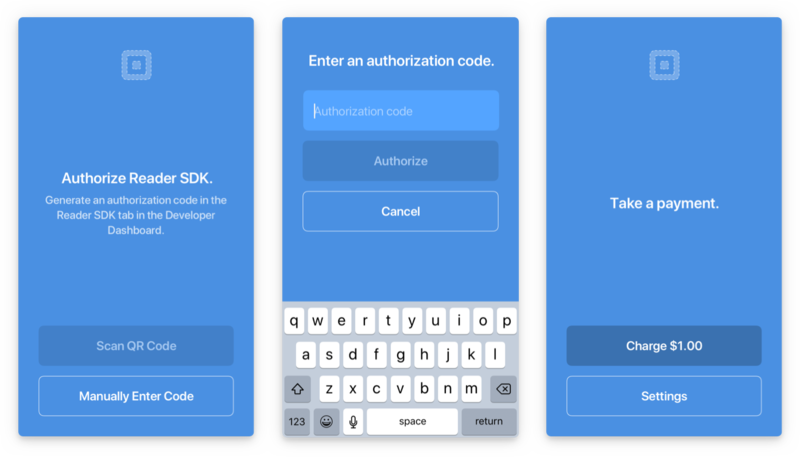 Go to the Reader SDK settings page in your Square Application Dashboard and generate a new mobile authorization code by clicking "Generate Mobile Auth Code". Tap "Enter Code Manually" in the sample app and paste the mobile authorization code into the field provided. You can view the transaction details in Square Dashboard. Change to the ios folder under example. Install ReaderSDK, replacing YOUR_SQUARE_READER_APP_ID and YOUR_SQUARE_READER_REPOSITORY_PASSWORD with your Reader SDK credentials. The command below will download the framework into the current directory. The framework must be in either the ios directory or the ios/Frameworks directory of your Flutter project. Launch the iOS emulator or connect to an iOS device with development mode enabled. Run flutter format to format lib/reader_sdk.dart.